First off my apologies for the quality of the sound. In the simulation it is much, much better. I think FRAPS does not like the sound chip on my motherboard. 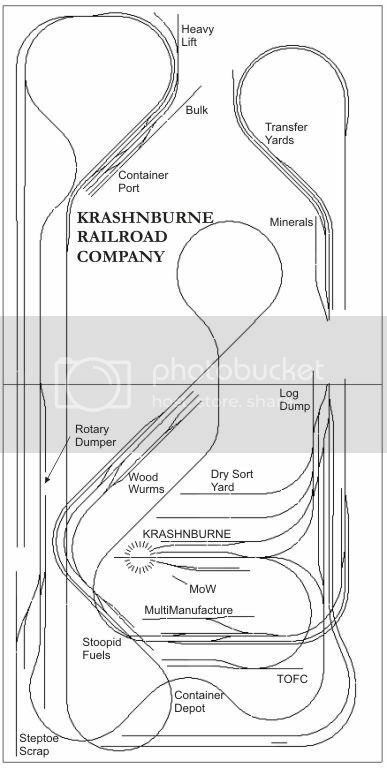 Krashnburne is a single track line with crossing loops. A portal at one end generates AI trainz with yellow freight cars at 10 minute intervals; a portal at the other AI trainz with green freight cars at 11 minute intervals. Hence the loops used by one one AI train to cross the other will change as a session progresses. The AI trains are instructed to take the right track at all loops and proceed to the portal at the end of the single track. The player, driving a yellow UP SD40 has a task to do (deliver tank cars and containers), but is free to do it in any way he sees fit. There are a few rules - obey the signal indications, return the switches with tall point stands to the straight through position, ... . The player's interactions with the AI could have been different if, for example, the switching movements took longer or if freight cars had to be dropped of at other locations. But as long as the player follows the Standard Operational Procedures the AI and player happily co-exist. SD40-2 sounding like a class 20, thats just not right lol. Sorry first thing that got my attention but some neat footage showing whats possible with TRS AI. The same dumb response that was posted on uktwatsim. Regardless of the fact the video does not portray the SD40 sounds at their best ( they are actually better in game ). The whole point about Phil's post both here and over there. Is that it highlights the fact that TS2010 AI operation is light years ahead of RW AI. As soon as i saw his post on uktwatsim, i knew exactly the kind of response his video's would get. The footie fans ( sorry Jim ) are so predictable. Thanks for the comments on the videos. They are appreciated. There is no denying that the sound in the clips is absolutely woeful. I can assure you that in-game it is much, much better. I think that the application I use to make the clips, FRAPS, does not agree with my motherboard sound chip. I've been following the thread on the latest RailWorks "Shunter" release. Am I correct in concluding it's yet another of the "do this by book exactly as instructed and do not think for yourself or you will fail" activity pack? If so then I'll give it a miss. In the words of Kennith Slessor "Time that is moved by little fidget wheels is not my time .. ."
It is much more satisfying and mentally stimulating to be given a task and then to work out the best way of accomplishing it. In some of the other activities for Krashnburne, for example, the dilemma is how to initially marshal the rolling stock so that drop offs and pick ups in the freight yards down the line do not require an inordinate amount of time consuming shunting. And to anticipate and work around the movements of the bi-directional AI trains that share the single track sections and the crossing loops. And, of course, to be able to say at the end "Well, I didn't do that too well. What I should have done is ... " and then go back and do it a bit better. It's a pity that RailWorks does not allow that type of activity - the freedom to think, to plan and, most of all, to interact with AI. It is possible to conclude that the RailWorks business model is to provide a string of exquisite and highly detailed payware add-ons while ignoring the fundamental shortcomings in the core program. Is this in the long term interests of the simulation? "I'd like to thank you guys for the way that the AI in TS2010 has matured to the extent that it really does display some Intelligence. I've achieved what I thought was impossible - bi-directional AI running on a single track with a player train co-existing with the AI." "Glad to hear it. I'd like to think that the same is true in most areas - since a lot of the new groundwork was done in TS2009, we're making small steps forward rather than large bounds. This gives us some time to pay attention to detail. Small bugs or weaknesses which might not mean much individually can add up to a lot cumulatively." Using Auran's paid staff to get the core right and progressively improving it while leaving the accessories (locomotives, rolling stock ... ) to others seems a eminently sensible and mature approach. Well, I responded to your response with the best advice I can give, fuggedaboudit. As for sounds, I wouldn't be able to tell the difference anyway, since GE and EMD sound alike to me, more like vacuum cleaners than locomotives. Give me the sputterin' smokin' coughin' snortin' CHUGGACHUGGACHUGGA! of an Alco any day. Trainz sounds get a lot of bashing, anyone noticed that while all three have visual coupler slack now, Trainz is the only one to have that lovely crashing and banging sound as the slack draws out or bunches up? Interestingly though, while the RailWorks Signaling and Scenario forums over at uktrainsim are almost dead, that thread of mine in the General Forum is one of the most viewed ever. And yes, that coupler slack, both in and out, is very pleasing to hear. I read your post on the beta testers forum Phil, i find Auran much more open minded than rs.com. But there again they have a far better product to work with. The only down side for me in Trainz and always has been, is that there are not any decent payware creators doing UK locos and rolling stock. The US scene has quite a few, RRMods, JointedRail etc. Of which i have bought a lot from RRMods. RailFail is no longer considered by myself as a viable sim. Spent loads of money on it, which is my own stupid fault. But i have since taken Jim's advice and no longer post about it, much less use it. Coupler slack in Trainz, particularly UK loose coupled wagons is almost orgasmic. Dadblasted furriner dinkytoy bumpercars don't even LOOK like trains! Curious Mike, exactly what kind of UK trains would you like to see? One item I'd like to see is dual powered traction (in Yankee Doodlish "traction" means electric, not diesel-electric) like the CTA 4000 series or North Shore interurbans. There are some North Shore interurbans made for Trainz, unfortunately they have this screwball EULA that prohibits distribution by any method other than email, which makes them pretty much useless for session creation. Pretty good selection of other US diesel, steam, and electric from what I've seen. Well, this being the screenshot forum guess I better post some screenshots before a moderator catches us doing all this screwing around, hey? I dunno if we want KrashNBurne reskins, so I'm using IndustRail to replace Onion Pathetic. Background? Oh, that's the new kid, hasn't been weathered yet. I really like Alco RS11s, so I'll probably do half a dozen in assorted states of abuse. Last edited by sniper297; 09-13-2010 at 04:00 PM. the sort of UK stuff i would like to see is high quality with proper cabs and sounds. Steam locos.........anything GWR and also released in BR-WR livery. Some good GWR coaching stock, with interiors. Also BR-WR diesel hydraulic loco classes, same as the ones released recently for RW. I would also like to see some of the earlier US SD series locos 9, 24 & 35, as i prefer the earlier ones. If there was a mainline US electrified route i would also like to see in Trainz the GE E60 locos. Don't want much, do i Jim. Don't sound like an extensive list to me, but then again the Mike I got sitting next to me here has a lot longer list of British equipment - I spent about 3 weeks downloading assorted Thomas the Tank Engine stuff and fixing errors so it would work in TS2010 native mode, now he wants all Skarloey's narrow gauge stuff. No rest for the wicked. Working on an SD-9 from TRS2004, before going on I gotta explain something. I know about the new SD9, and I fully sympathize with creators refusing to send stuff to the download station, but to me "google the KUID" is an idiotic game I refuse to play. I'm astonished all youse guys have put up with it all these years. Therefore unless all dependencies will get automatically downloaded along with my repaint, I just won't repaint it. That said, the current SD9 has something wrong with the numbering system, all the bits and pieces are there but it won't number. I fixed the bogey and wheel height, still tinkering with the cabview, it requires a custom cabview since the mesh has the cab attachment point WAY off kilter. Got real bogeys with rotating wheels, no numbers. Meanwhile the Alco RS11s work okay, with all the "forward progress" hullaballo I've converted these to build 2.9. So it will require quite a bit of tinkering to get it ready for prime time. If the guy who made the new SD9 uploads all the required dependencies for that one to the DLS I might stop and repaint that one, otherwise I'll continue working on this one.